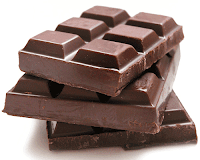 An Extract of Reflection: Is Chocolate as Healthy as Fruit? No way, we simply can't let chocolate run out... what else gets you through all the trials and tribulations of life? How would we survive those long, creative, winter evenings, creating the latest delicious blogs for public consumption... how could we serve up such great blocks of information, in such a smooth way? We simply couldn't crunch our way through the shiny wrappers of numerous publications we've found on the shelves of knowledge, nor could we lick the many calorific, I mean horrific, nuts that abound... it's not that I'm addicted to chocolate, it doesn't consume my life, why, I hardly even think about it... back in a moment.